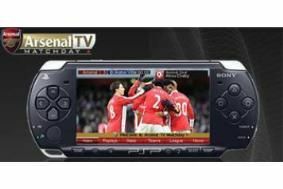 Sony PSP app gives Arsenal fans live football and instant replays in the ground | What Hi-Fi? Available for £10 for the remainder of the 2009/2010 season, the application will offer supporters replays, slow-motion footage, live match statistics, team sheets, player profiles and more. Pre-match video content and editorial news will also be accessible through the application, sourced from Arsenal.com. Fans will also be able to vote for their man of the match, access the league table and see live scores and results from other fixtures. After downloading the Arsenal TV Matchday + application supporters will automatically be able to access a secure, hidden Wi-Fi network which will then stream the images direct to the device. Access to games being played in the 2010/2011 season will go on sale during the close season. Emirates Stadium is the first sporting venue to install the system but it's hoped that others will follow suit soon.